If someone in your family has continence needs, equipment is available to help you at home, or when you are out and about. To view continence aids (which can be used as an alternative to the toilet, or to assist when using the toilet), visit your nearest Disability Information Centre, or make an appointment with your DHB’s continence assessment service. Your GP can refer you for a continence assessment, or you can talk directly to an advisor if you want to know more about managing continence at home. To find your nearest advisor, phone the NZ Continence Association Helpline at 0800 650 659. A registered occupational therapist will assess your situation and recommend or prescribe appropriate continence equipment. This can be coordinated via your hospital or GP. Assistance with installation may be needed with some equipment. Professional advice will help to make the best choices. The toilet isn’t the only device we can use to go to the bathroom. Here are some alternatives! Bed Pan Useful for people who cannot get out of bed to use the toilet. Can be used under a shower chair or commode. Needs to be placed under the person and for removal and disposal. Bottle (Urinal) Useful for men who are able to ‘aim’ well. Men with eyesight or hand problems may need help holding a bottle in place during use. A jug or bucket may be easier to use. Female Bottle Useful for women with poor mobility or who are in a wheelchair. May require help to hold in place during use. Catheter Catheters are flexible tubes that are inserted into the bladder for urine drainage. Some catheters are inserted, then removed immediately once the bladder has been emptied (an intermittent catheter). Others are left in place for the bladder to continually empty (an indwelling catheter). Catheters are not suitable for everyone and are used under medical supervision. Commode A portable toilet for people who have difficulty getting to the toilet on time, or if the toilet is too far from the bedroom. Disposable Bottle For men or women. Has non-return valve for no-spill. Useful when going out, and if disposal of the bottle is preferred (rather than reusing). Grab Rails Rails fitted to the toilet wall to help people get on and off the toilet. Non-Spill Bottle Useful for men. Can be used in bed without ‘back flow’. Men with eyesight or hand problems may need help to hold it in place during use. Sheaths An alternative to pads for men. Also known as external catheters or condom catheters, they attach to a leg bag for drainage. Shower Chair with Commode Seat A commode chair on wheels, to use in the shower or for easy transport to the toilet. The chair can be backed in over the toilet bowl. Some designs can slot a bedpan beneath the seat. Slipper Pan Used for people who cannot lift their hips too high or move too easily. Requires help to be placed and removed. Travel Bottle For men or women. A collapsible rubber bag with a lid. Compact to carry and use. Reusable. Toilet Seat Raiser with Rails A raised toilet seat with armrests and adjustable legs for height, to help people get on and off the toilet. Caution If their feet can’t touch the ground, the person may become constipated. 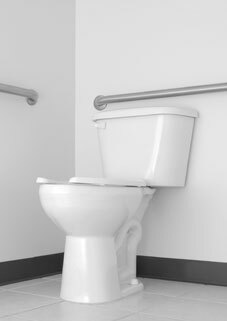 Toilet Surround A frame that fits around the toilet with arm rests and adjustable legs for height. To help people get on and off the toilet without raising the seat. Other Equipment Aids to assist with continence are available for many needs, from bed poles to help the person get out of bed, to alarms for those with bedwetting problems. A continence advisor can help you decide what disposable pads, bed mats, or other products are best for your situation. To learn more, phone the Continence Helpline. An occupational therapist (OT) will be able to assess your needs in the home. The OT can help to select equipment and suggest modifications for your home to make moving, handling, and personal hygiene easier. Equipment and modification costs may be covered by the public health system. Seek professional advice about your options. We are happy to answer your questions, and refer you to other sources of help. Carers NZ maintains a National Issues Register so carers have a way to submit concerns to government agencies and other decision-makers. Our Issues Register provides a way for us to spot problem areas, trends, regional concerns, and opportunities to improve services for families with health and disability needs. Log a concern using the form. How Would You Like To Keep Up To Date? Subscribe to our email newsletter by filling out and sending the form below.